If we want to increase ridership on public transit, we must consider the barriers to using it. My first blog on Blue Oregon back in July of last year was an issue about accessibility and accommodation of parents and guardians riding with children. I had first shared this idea with the founders of the MotherPAC and they had encouraged me to followup on this issue as they, along with mothers from Urbanmamas.com, had been in talks with TriMet on this very issue a year or so back. I thought Blue Oregon was the perfect place to have this conversation and was delighted when Josh Collins of TriMet was thoughtful enough to post a comment on my post about TriMet's policy. An e-mail exchange and a meeting at TriMet resulted in a TriMet-led Space Management Summit where Lisa Frack (MotherPAC, Family Forward Oregon) and I were able to meet with other concerned riders about space management issues. It became clear early on in the meeting after a presentation by TriMet that the group of riders who ride with children were not a part of the official planning or stakeholder engagement process. Advocates for seniors and disabled passengers, a cycling advocate and an advocate for riders who speak English as a second language have official roles as part of TriMet's community committee structure, however no such role exists for a parent or guardian riding with kids advocate. We also discovered that TriMet's rider survey results did not include statistics about parents or guardians traveling with young kids. Nor did any of their capacity planning or train design drawings demonstrate the need for space for parents/guardians traveling with kids -- in particular the concept of what to do with strollers (a necessary traveling tool for any long-term trip with an infant or small toddler) was not included in these drawings. In addition, the campaign to "Respect the Ride" did not include any rider instruction on how to respectfully ride with young kids or to be a helpful passenger to a rider with young kids. There also was no other signage on the bus or MAX to suggest that there may be riders with young kids traveling and how to best share space on TriMet between all riders. And knowing how to share the space is particularly important, because of the necessary and critical accommodations and legally-protected space for disabled and senior passengers, who should not have to be put in a position to ask for this space, but are often blocked from access by riders (including parents traveling with young kids) who have no other place to sit with their stroller, luggage or otherwise bulky or irregular "cargo". I say all this because I was impressed with how TriMet included us in this meeting and brought different rider groups together. It wasn't a perfect meeting and we didn't all agree on everything, but it was clear in the room that there did need to be a way for parents and guardians riding with kids to know where they were allowed to use additional space on MAX and the bus. And TriMet came back with a list of improvements they were planning to implement to make riding on TriMet a better experience for parents and guardians with young children -- work that is still very much in progress. 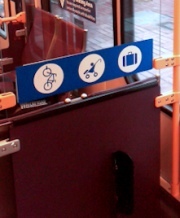 One of our early suggestions on the MAX side was to have a multi-use sticker for the bike hanger area to make sure that it was clear that riders with various cargo could use this area. 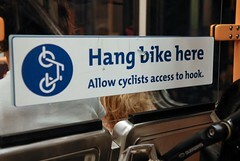 Yesterday on BikePortland.org, a blog post showed early evidence that these new multi-use stickers were indeed being placed on MAX as TriMet had promised. The original sticker as shown, implies that bikes had priority to this area. Now, it more adequately represents that this is a multi-use area as space allows. I know that cycling advocates at BikePortland.org are concerned about the impact of this new sticker to the cycling commuting community and I think their concerns are valid -- I do think the overall message of this new sticker is that we all need to share our places on the road. A cyclist sharing the space on MAX with a parent or guardian with a young infant one day (there is room for a bike to hang and have a parent or guardian with a stroller stand there). A car sharing the road with a cyclist by observing bike lanes and making safe right-hand turns another day. A parent or guardian with a stroller moving for a senior or disabled passenger without being asked. All of us being more attentive to pedestrians. To me, it's about the fact that we all have places to go, things we feel are necessary to bring (whether it be a bike, a stroller, luggage for the airport or a basket of laundry). We should honor the fact that people with larger or irregular cargo have chosen to use public transit rather than put one more car on the road and make sure they are welcomed and have a place on our system. And of course, we should all consider our fellow passengers when bringing along these items. Space on the bus and MAX is limited and certain times in the day are specifically challenging. We all need to continue to advocate for TriMet to include different rider groups in their capacity and design planning processes so that our transit system is not only well-used but also accessible to senior and disabled passengers, cyclists, and parents and guardians with young children and others. If we want to increase ridership on public transit, we must consider the barriers to using it. Unfortunately, as a frequent user of Max with my bicycle, I feel that this change in policy will produce immediate negative impacts for all Max passengers . Based on personal experience, the clear demarcation of specific spaces for bicycle storage and the expectation of access to the hooks have been very successful at keeping the majority of bikes stored safely and paths of entrance and exits clear for all. By limiting access to the hooks, which are already inadequate to receive peak hour usage, we will experience many more incidents of bikes unsafely blocking the aisles. By creating a mixed use area where there used to be four reserved spaces for bikes, Max has created a new policy in which there are potentially no reserved space for bikes. I am also concerned that promoting the bike hook space for strollers will create more horizontal clutter near the front and rear car doors, where many folks already congregate (even on trains with adequate room at the center). Strollers have a much wider foot print than bikes do, and you can't hang a stroller on the hook to get it out of the way. I believe this new policy will have unintended negative consequences that will negatively impact the quality of Max rides for everyone, and wouldn't be surprised if it were altered or rejected due to public outcry sooner rather than later. "you can't hang a stroller on the hook to get it out of the way" --- depends on the stroller. More on point: it's important to remember that "bicyclist" and "stroller-user" are not human sub-species, but rather temporary behaviors. Today's bicyclist is tomorrow's parent w/ stroller, who will soon again be a bicyclist or a pedestrian. We want mass transit to be amenable to all usage patterns - otherwise, by forcing or encouraging people to break the mass-transit habit, we run the risk of losing that rider forever. Last thought, for Ron and others: The solution described may not be perfect. The question for critics is: what's your alternative? Let's be constructive, rather than merely critical. "otherwise, by forcing or encouraging people to break the mass-transit habit, we run the risk of losing that rider forever." Having young children is a temporary phenom, but coping mechanisms such as embracing car culture and moving to the suburbs have a long tail. That doesn't just affect transit ridership, it has political consequences. The disciplining of commenters could have a chilling effect no? Wouldn't it be more constructive to address the substance of misgivings rather than create an enthymematic ad hominem attack on Mr Morgan by implying that his comment was meant to be destructive? From what I was told by TriMet, it is not a new policy. The area was always meant to be shared by things like strollers and bikes. However, the signage did not reflect that. As such, people with bikes would expect parents with folded strollers to vacate the area so they could hang their bike. I know I've certainly be in that position more than once on a crowded train. With the new signage, people realize that the area is for sharing. Public transportation works when we are courteous and share the space, no matter if we have kids, ride a bike, are disabled, or whatever. People keep telling me I should just go "Dr. House" on people the next time they refuse to move out of disabled seating when I get on the bus (I walk with a cane and cannot stand while the train/bus is in motion). I'm both and have hung a jogging stroller up at least once. As a father of three daughters whose births were spaced about three years apart, I've been there. One in a stroller, one in a backpack and one holding my hand. Used public transit regularly too, often by necessity and it was always an adventure in logistics. As a rider of Max, I'll adjust. If it becomes as messy as I anticipate, I'll opt not to use Max, and either use a bus with a reserved space for my bike or my car. I don't want to compete over space with children, who are soft and permeable, with my bike, which is stabby and hard. It's a terrible mixed use. IMO, the solution is to revert to the old policy and provide better education to riders, those who use strollers and those who don't, about stroller access, keeping clear entrance and egress, the etiquette of space, etc. Better education would be a fine thing, but doesn't answer the question: where should the strollers go? Well, IMO that's a question that should have been addressed in the car design phase, because the present car configuration offers no easy answer. Max cars have designated places engineered to meet ADA requirements, to accommodate safe bike transportation and to insure safe entry and egress for other passengers. There is no space so designated nor engineered for strollers. Simply designating a space engineered for other use to strollers usage doesn't really answer the question of where strollers should go. As a disabled woman who frequently uses a walker, I welcome this dialogue. I would estimate that fully 50% of the time I use MAX, I must try to fit my walker and myself into a non-disabled area, because parents with strollers have taken the only available disabled spaces, and will not volunteer their seats to me. At my regular stop (Willow Creek), there is one young woman (who obviously also lives in the area) who will literally footrace me to the nearest disabled spot. Since she is young and able-bodied, she gets to the spot first, and I am left walking the length of the car to the other disabled area (forcing people to pick up their feet and move out of my way as I wheel down the aisle,) or leaving the MAX car altogether and getting on the next one in search of accommodation. I recall one particularly memorable MAX ride, where two very young mothers were sitting in the disabled seating along with their kids in strollers. They chatted on the phone and laughed with each other, put their feet up on the disabled grab bars, etc., all while a person in a wheelchair, a person in a scooter, and me with my walker were crammed in the open spaces by the doors. They looked straight at us and didn't move a muscle, nor did our misery or the bunged-up flow of traffic around us detract from their enjoyment of their privilege. I am unable to stand for long periods of time without serious health repercussions, and going without a seat is very hard for me. I know, though, that I will be labeled as the "bad guy" if I ask a mother with a stroller to move. Clearing up the usage priorities with signage posted in the disabled areas would probably help me catch the attention of able-bodied parents who can stand elsewhere with their offspring. Thanks for bringing up the topic. I welcome advocacy and planning for parents with strollers, and how we can share space without rolling over each others' toes. I agree with you on preferring to have the toddler strapped in on a MAX train. When it is crowded and you are swaying around, I certainly don't want to be trying to hold onto my kid with one hand and a folded stroller in the other. Thanks, Nova, for the constructive dialogue. It's very comforting to know that folks like you and Lisa are being included in this conversation! As a participant in both the initial meeting with Urban Mamas and in the meeting Nova writes about, I was thrilled to see the installation of the new decals on MAX trains. I have since moved on from TriMet to the work/live/play in the Twin Cities, but agree that TriMet (probably all transit agencies) can do more to make caregivers feel more "represented" on the system. I also happen to think that they WILL do more. This is a good step, because it isn't a policy change--despite the fact that some are saying it is--it represents the way those spaces are supposed to be used. It also more closely reflects the reality of HOW the space is being used. To Nova and other caregivers who will work with TriMet in the future, I think that you will find that the agency wants to make sure that customers of all walks of life are welcomed onto the system. The key is to open a dialog with staff to find a solution, rather than gripe in the background. In this case, you did the former and it appears to be making a difference.